Few entry-level luxury sedans are loaded straight out of the box, and if they are, the price tag is appropriately high. Not so with the 2016 Lincoln MKZ. It has a long list of standard features and it won't put a massive strain on your finances. You can get a fuel-sipping hybrid version, too. Read more to decide if the MKZ is for you. For 2016, the Lincoln MKZ is essentially unchanged. Sleek, eye-catching exterior design; high fuel economy from available hybrid model; comes equipped with many convenience/luxury features as standard. It has been more than a few decades since Lincoln was a sought-after nameplate. Recent years have seen the brand make a more concerted effort to differentiate its various models from the Fords on which they're based. 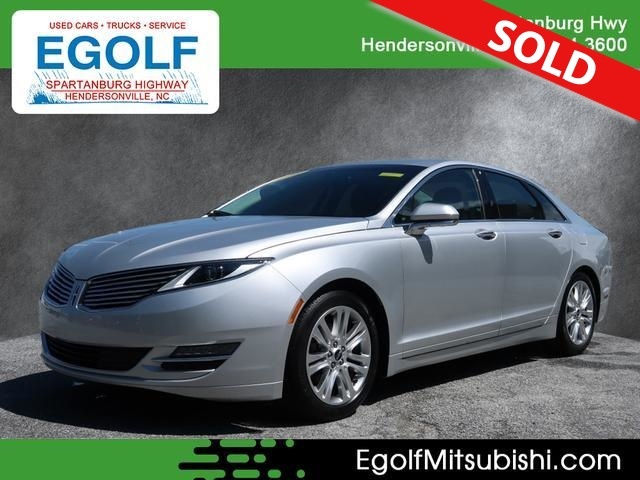 One example is the 2016 Lincoln MKZ, which broke out from its previous and obvious Ford (Fusion) mold a few years ago with sleek, distinctive styling. But whether that's enough to raise the status of the brand, or make the MKZ a truly desirable luxury sedan, is another matter. The 2016 Lincoln MKZ's eye-catching sheet metal hides Ford Fusion underpinnings. Underneath the handsome skin, this Lincoln is still pretty much a Fusion. But that's not necessarily a bad thing. The MKZ offers either a turbocharged four-cylinder or a V6 engine, both with available all-wheel drive, or a fuel-sipping hybrid powertrain in the MKZ Hybrid. Ride and handling qualities largely match those expected of a luxury sedan, and the MKZ comes standard with an adaptive suspension and active noise cancellation. Meanwhile, the cabin makes a clean, modern styling statement and comes standard with plenty of the latest high-tech luxury and safety features. Unfortunately, the MKZ's modern-looking interior comes with a smooth, futuristic center stack that lacks the tactility and ease of use for audio and climate functions that traditional buttons and knobs provide. It's part of the MyLincoln Touch system that also includes a pair of customizable instrument displays and the Sync voice control system. The voice system works exceptionally well, but we've found the various touch buttons slow to respond on occasion and not that intuitive overall. Also, the MKZ's interior materials look more luxurious than they feel, though the Black Label versions do kick it up a notch. A better choice for an entry-level luxury sedan might be the Lexus ES 350 or the ES 300h hybrid. They are the MKZ's closest competitors, and they generally have an edge thanks to their well-built interiors and plush ride quality. Others to consider include the well-rounded Acura TLX and Volvo S60, as well as the sporty Audi A4 and BMW 3 Series. While the German-brand sedans can get pricey compared to the MKZ, they're our top choices for a refined driving experience. Overall, we've given the MKZ a "C" rating. It could be worth a look, but we suspect most car shoppers will be happier with one of the aforementioned entry-level luxury sedans. The Lincoln MKZ is a midsize luxury sedan that comes in two trim levels: base and Black Label. Both are available for the MKZ Hybrid as well. The base MKZ (called Premiere) is well equipped with 18-inch wheels, automatic and adaptive LED headlights, LED taillights, power-folding sideview mirrors, adaptive suspension dampers, keyless ignition and entry (with an outside keypad), dual-zone automatic climate control, leatherette upholstery, a 60/40-split folding rear seat, heated eight-way power front seats with power lumbar, driver memory settings, a tilt-and-telescoping steering wheel, cruise control, an auto-dimming rearview mirror and full power accessories. Standard tech equipment includes an 8-inch touchscreen (MyLincoln Touch), configurable gauge cluster displays, voice commands (Sync), a rearview camera, rear parking sensors and an 11-speaker sound system with a CD player, auxiliary and USB inputs and satellite radio. The optional Select package features headlight surround accent lighting, an auto-dimming driver-side mirror, a power tilt-and-telescoping steering wheel, leather upholstery, ambient lighting and HD radio. The Reserve package includes those features plus a navigation system, a blind-spot monitoring system with rear cross-traffic alerts, a power-closing trunk lid, a heated steering wheel, a 110-volt power outlet (standard for the base MKZ Hybrid), ventilated front seats and heated rear seats. For the Select and Reserve packages, a choice of power sunroofs (standard and panoramic), inflatable rear seatbelts and a premium 14-speaker surround-sound audio system are also available. Nineteen-inch wheels are optional for any MKZ. Choosing the Select or Reserve package also allows you to add the Technology package, which bundles adaptive cruise control, automatic high-beam control, an automated parallel parking system, a lane-departure warning and intervention system, and a forward collision warning system with brake priming. The Reserve package also allows you to select the Summer Tire Handling package (AWD only, non-Hybrid) that includes 19-inch wheels, summer tires and a sport-tuned suspension and steering system. The Reserve can also be ordered with multicontour massaging front seats and a power rear sunshade. The Black Label series essentially starts out at the equipment level of an MKZ with the Reserve package and adds an "experience liaison" (who will meet the customer and assist in the shopping process) and unlocks your choice of four premium interior design schemes (called Indulgence, Oasis, Modern Heritage and Center Stage) that boast premium materials including special leather upholstery and designer wood trim. The Black Label also offers exclusive exterior colors. The 2016 Lincoln MKZ offers three engine choices. A 2.0-liter turbocharged four-cylinder is the base engine, generating 240 horsepower and 270 pound-feet of torque through a six-speed automatic transmission. Front-wheel drive is standard, and all-wheel drive is optional. In Edmunds testing, an all-wheel-drive MKZ with this engine accelerated from zero to 60 mph in 7.2 seconds, a slightly slower than average time for the class. The EPA fuel economy estimates for the non-hybrid models with the base 2.0-liter four-cylinder engine are 26 mpg combined (22 city/33 highway) for the front-drive MKZ and 25 mpg combined (22/31) for the AWD-equipped MKZ. The optional 3.7-liter V6 engine produces 300 hp and 277 lb-ft of torque, also through a six-speed automatic and either front- or all-wheel drive. In Edmunds testing, a V6-powered all-wheel-drive MKZ covered zero to 60 mph in 6.7 seconds, about a second slower than average for an entry-level luxury sedan with an upgraded engine. Front-drive V6 models return an EPA-estimated 22 mpg combined (18/27), while all-wheel-drive models achieve 20 mpg combined (17/24). The 2016 Lincoln MKZ Hybrid pairs a 2.0-liter four-cylinder engine with an electric motor to produce a total of 188 hp. That power goes to the front wheels (no AWD version available) through a continuously variable automatic transmission (CVT). In Edmunds testing, an MKZ Hybrid accelerated from zero to 60 mph in 8.9 seconds, slower than average for a midsize hybrid sedan, and about a second behind the Lexus ES 300h. The EPA estimates 40 mpg combined (41 city/39 highway). The 2016 Lincoln MKZ produces 300 hp with the optional V6. Standard safety features include antilock disc brakes, stability and traction control, front side-impact airbags, front knee airbags, side curtain airbags, a rearview camera and rear parking sensors. The 2016 Lincoln MKZ also features the programmable MyKey system, allowing parents to set limits for vehicle speed and stereo volume for their young drivers. Sync also offers emergency crash notification that automatically dials 911 in the event of an airbag deployment. Optional equipment includes blind-spot monitoring; rear cross-traffic alerts; a lane-departure warning system; a lane-departure intervention system (which automatically helps the driver keep the car in its lane); a forward-collision warning system with brake priming; and inflatable rear seatbelts. In Edmunds brake testing, an MKZ with standard all-season tires stopped from 60 mph in 121 feet, an average distance for this segment. The MKZ Hybrid did slightly better at 120 feet. In government crash testing, the MKZ earned a top five-star rating for overall crash safety, with five stars for total frontal-impact protection and four stars for total side-impact protection. In Insurance Institute for Highway Safety (IIHS) tests, the MKZ earned a top score of "Good" in the moderate-overlap frontal-offset, side-impact, roof-strength and whiplash protection (seatbelts and head restraints) tests. A second-best score of "Acceptable" was awarded for the car's performance in the small-overlap frontal-offset test. Inside, the 2016 MKZ's flowing center stack and console, without buttons or knobs, looks mildly futuristic. But while the aesthetic is distinctive, the materials don't go much beyond what you get in the related Fusion. The seemingly brushed metal accents look nice from afar, but are exposed as silver-colored plastic upon closer inspection. Rather than a steering-wheel- or console-mounted gear selector, the MKZ uses dash-mounted selector buttons for the transmission, but they feel somewhat flimsy as they lack any damped, tactile sensation. The MKZ's styling distinctions also yield slightly less interior space than the Fusion. The high center console can make the front seating area feel a little confining, while the coupelike roof line infringes on the headroom of taller rear-seat passengers. Rear-seat legroom, however, is generous. The standard MyLincoln Touch (a.k.a. MyFord Touch) system handles Bluetooth, audio, navigation and other vehicle functions via its crisp 8-inch touchscreen. And there's still the useful Sync voice command system that can control many of the car's functions. In practice, however, the touchscreen's processing speeds still seem sluggish during certain tasks, and the center stack's touch-based controls can be fiddly and/or frustrating to use. The MKZ offers decent trunk space at 15.4 cubic feet, though the hybrid's capacity shrinks to 11.1 cubic feet due to the battery pack. Non-hybrids also feature a 60/40-split folding rear seat. Equipped with the standard 18-inch wheels and all-season tires, the 2016 Lincoln MKZ offers a quiet, compliant ride that's exactly what we'd expect from this class, and more particularly, from Lincoln. However, we've also tested an MKZ with the optional 19-inch wheel and summer-tire combo with the sport-tuned suspension, and it had a stiff, noisy ride. If you're looking for comfort, we recommend staying with the standard 18-inch wheels (or optional 19s) with all-season tires. Something you might not expect from the MKZ is its composure when going around turns. The standard adjustable suspension and quick steering make the MKZ feel more alert than any other Lincoln in recent memory. The MKZ isn't quite as sporty or agile as its German rivals, but most consumers will find it competent and enjoyable in this regard. The available all-wheel-drive system doesn't offer a handling advantage on dry roads, so we really only recommend that option for buyers who frequently drive in inclement weather. Although the V6 offers more power, we've found the turbocharged four-cylinder is the better choice. It feels nearly as strong when you're accelerating in traffic, and it returns much better fuel economy. That said, neither engine is a standout, as many competing sedans provide quicker acceleration, particularly if you opt for one of their upgraded engines. The 2016 Lincoln MKZ Hybrid is generally as pleasant to drive as its gasoline counterparts, and it maintains the ability to negotiate corners and curves with confidence despite the added battery weight. The hybrid rides smoothly and acceleration is adequate around town, but give it the spurs and you'll soon notice the engine droning as it maintains constant revs, which is a common characteristic of cars with CVTs. There's enough passing power on the highway, too, especially if you plan ahead. As with most hybrids, the regenerative braking takes some getting used to, and inching forward or backward into a parking spot takes a delicate touch on the brake pedal.